As predicted, RIM was in fact building a tablet and they were indeed about to unveil it to the public. RIM has just announced their BlackBerry tablet at their San Francisco developers’ conference and it’s not called the BlackPad. 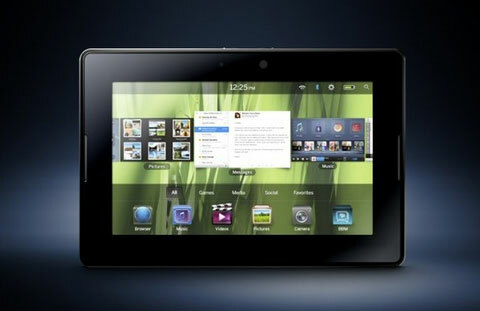 The tablet is called PlayBook and initial details given at the event show that the device has a lot of potential to capture consumers’ attention. The Playbook has a 7-inch display, 1GHz dual-core CPU, 1GB of RAM, Cortex A9, an e-reader app, webOS-like app switching, and the rumoured ability to tether to a BlackBerry phone is there too. It runs Flash 10.1 and HTML 5 along with supporting 1080p hardware accelerated video. There is Micro HDMI and Micro USB connection, along with a 3MP front and 5MP rear-facing camera and the HDMI connection can even output video to dual displays. RIM assured at the developers’ conference unveiling that PlayBook is fully compatible with BlackBerry Enterprise Servers right out of the box. The tablet can also tether directly with a BlackBerry device via Bluetooth. There was no mention of the tablet’s price but it begins to ship in early 2011 in the US and in the second quarter of the year for international markets. Check out a quick recap of the Playbook’s major features below and also watch the video launched at the RIM developers’ event. •	7″ LCD, 1024 x 600, WSVGA, capacitive touch screen with full multi-touch and gesture support. •	BlackBerry Tablet OS with support for symmetric multiprocessing. •	1 GHz dual-core processor. •	Dual HD cameras (3 MP front facing, 5 MP rear facing), supports 1080p HD video recording. •	Video playback: 1080p HD Video, H.264, MPEG, DivX, WMV. •	Audio playback: MP3, AAC, WMA. •	Wi-Fi – 802.11 a/b/g/n. •	Connectors: microHDMI, microUSB, charging contacts. •	Open, flexible application platform with support for WebKit/HTML-5, Adobe. •	Flash Player 10.1, Adobe Mobile AIR, Adobe Reader, POSIX, OpenGL, Java. •	Ultra thin and portable. •	Measures 5.1″x7.6″x0.4″ (130mm x 193mm x 10mm). •	Weighs less than a pound (approximately 0.9 lb or 400g). •	Additional features and specifications of the BlackBerry PlayBook will be shared on or before the date this product is launched in retail outlets. •	RIM intends to also offer 3G and 4G models in the future.